This walk: 2013-8-14. 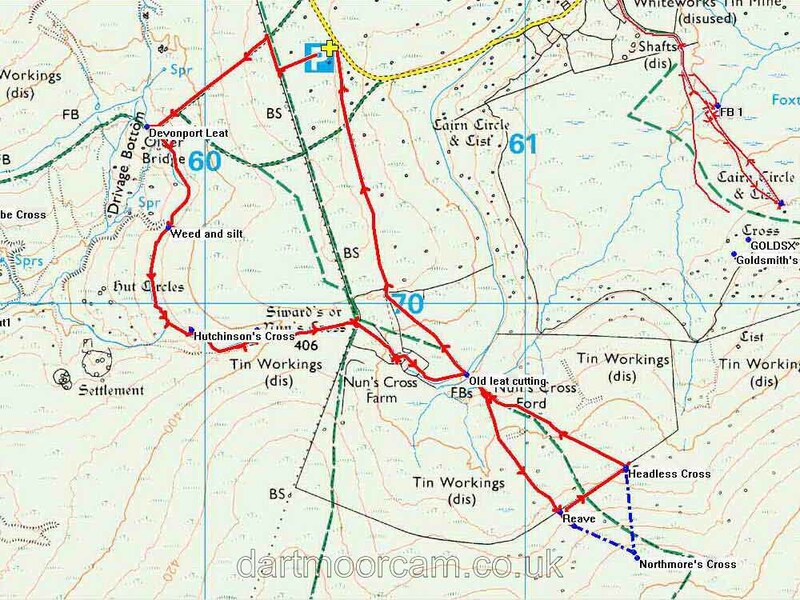 Devonport Leat, clapper bridge, spillway, Drivage leat hut, Hutchinson's or Devonport Leat Cross, leat tunnel, dung bonnet, Old Smithy, Nun's Cross Farm, Northmore's Cross, Headless or Whealham Bottom Cross. Other walks in this area: 27 December 2008, 14 October 2009, 4 March 2010, and 18 July 2012. Self-explanatory notices, seen near the car park. As previous photograph. This is near the Newleycombe watershed, one of the most extensively tin-worked areas, with docum,entation from 15th. Century. A "fettled" photograph - this was a very mistry and wet day. Hutchinson's or Devonport Leat Cross. Eastern face of the pillar, "1887 - 1966". Devonport Leat exiting the tunnel near Nun's Cross, built in the 1890's -the leat was built 1793-1801. The tunnel is 700 yards (640 metres) long. View from the lip above the tunnel. By special request: Dung Bonnet (Bolbitius vitellinus), a coprophilous fungus that breaks down dung. These are larger and more delicate than Dung Roundheads (Stropharia semiglobulata). View from the west ..... look at the rain! View from the east, quickly taken as it was zinging down at the time! Northmore's Cross - a personal cross at SX 61351 69203 � 5 metres, made from a brass ship's propeller, check the link for more details. Clearly, this photograph was taken in better weather, on 14 October 2009. Unfortunately, the cross has now been vandalised. Another clapper bridge and nearby sluice. Close-up of the inscribed cross - some could see a second, smaller cross above the obvious one?. Rear face of the cross with seemingly nothing inscribed. 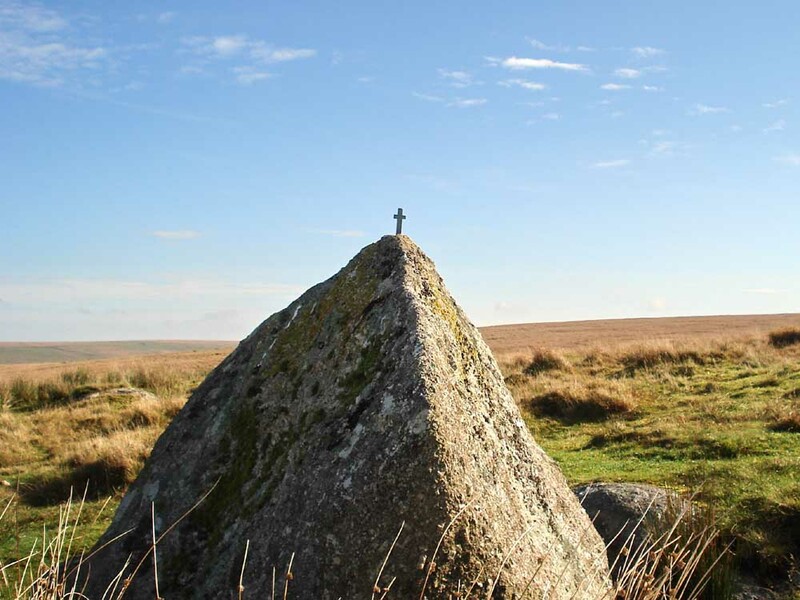 This walk was reached, from Plymouth, by turning right, down Tor Royal Lane, after the mini-roundabout in Princetown, after the Plume of Feathers public house and driving down to the quarry marked by the yellow cross and the P symbol on the map. Distance - 5.56 km / 3.46 miles.